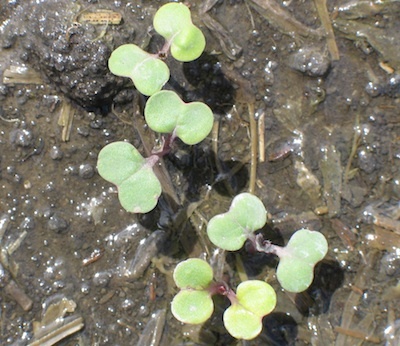 Canola seeding is complete or nearly complete in most regions, and timely rains mean rapid crop establishment and reduced flea beetle threat for more regions — although see the Tweet of the Week below. 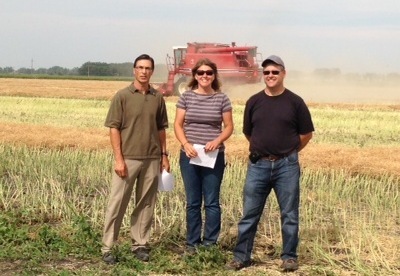 Good growing conditions also mean heavy weed growth, especially in fields that did not get a pre-seed burnoff. Rates may need to be at the high end of the label for larger weeds, and grassy weed tank mixes may be required to get control and stay within label rate restrictions. Growers with unexpectedly good growing conditions may see the benefit in a fertilizer top up. The best method is to dribble on liquid or float on dry. Applying through the sprayer in a tank mix with herbicide is not the answer as rates are not high enough to be meaningful and full leaf coverage can cause serious crop damage. For those seeding in June, we have links to helpful articles on how to make a crop mature earlier, risks with late seeding, and broadcast seeding tips. What caused the pinched stems in these two plants? Take a look at the weed spectrum in each field before heading out to spray canola. 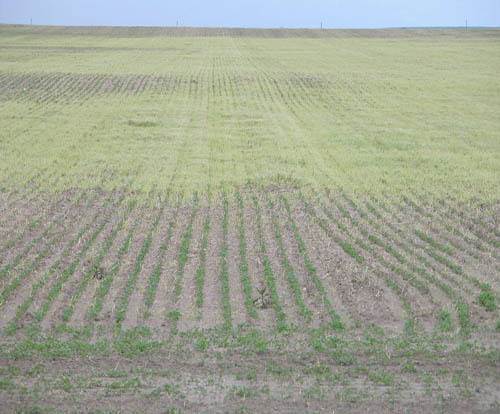 In some cases, the straight partner herbicide may not be enough to take care of the weeds present, and tank mixes may be required. Read on for examples. The best method is to dribble on fertilizer in a concentrated band rather than as a spray mist. Tank mixing with the herbicide, while it may be possible if the herbicide manufacturer approves, will not allow high enough rates to make any useful difference to the crop. The fine mist may also damage the crop. Growers in areas where blackleg infection was known to cause yield loss last year may choose to apply fungicide early in the season. —Lesions on leaves or cotyledons. These tiny lesions may be tricky to spot, and you probably won’t see many of them. When scouting, also look for blackleg pseudothecia (black spots) on old canola residue, which may still be present on fields with a tight rotation. 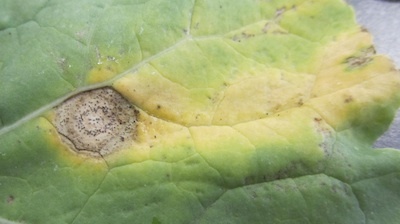 Note: Even if you can’t spot lesions on new plants or black spots on old stubble, infection could still be happening. 2. Be sure the insect or disease is apt to cause economic damage or yield loss. 3. Un-needed sprays put beneficials at risk. 4. Sustainability — of both our management tools and our farming system. How many tank mixes are too many? The jar test may give the producer an indication of the last two problems (chemo-physical compatibility) but won’t tell them a thing about the biological compatibility of the components. The best source of information about all of the points is going to be the manufacturers of each of the components in the mix. Cutworm activity has been light so far this year, with a few fields sprayed across the Prairies. We do expect to hear of more cases as crops start to emerge and feeding patches start to show up. 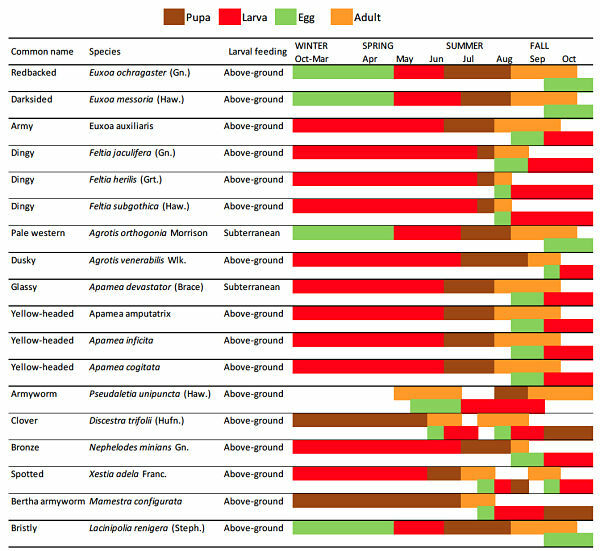 Keep an eye out as many cutworm species will feed on canola, and each has its own cycle — as the table shows. Cutworms can feed well into July. While digging around for cutworms, collect them and send them into the survey. Read more to find out how you can help with the Prairie cutworm survey. There are no reliable solutions to crusting other than to wait for rain. Some growers have reseeded the worst sections of fields. A light harrowing might help if nothing has come through. 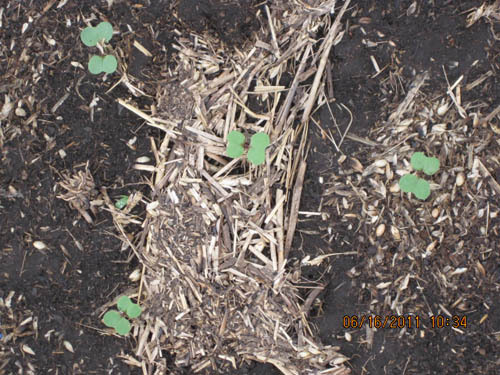 Do a couple passes then assess whether canola seedlings are being ripped out of the ground. 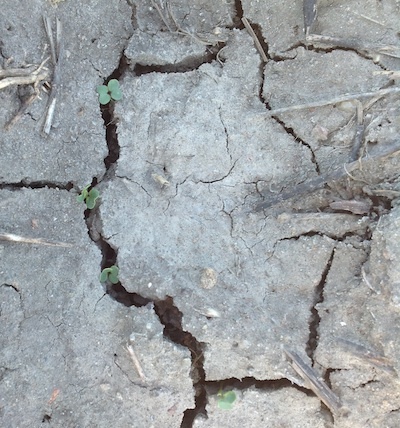 Harrowing too close to emergence can be harmful to a shallow seeded crop such as canola and may not be worth the risk. Using a roller may be worse than harrowing when soils are wet below the crust. Instead of cracking up the soil surface, a roller could turn the whole topsoil zone to concrete. Again, there is very little research on how to manage crusting. It’s trial and error. Heavy rains in the past week left some Prairie canola fields under water. 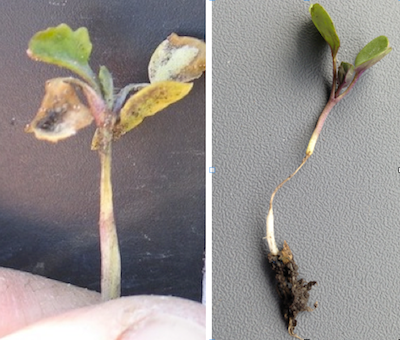 Canola is quite susceptible to water logging and shows a yield reduction after only 2-3 days with wet feet. Wet soils cause an oxygen deficiency, which reduces root respiration and growth. Root failure reduces nutrient uptake, and plants will eventually die unless drowned areas dry out quickly. 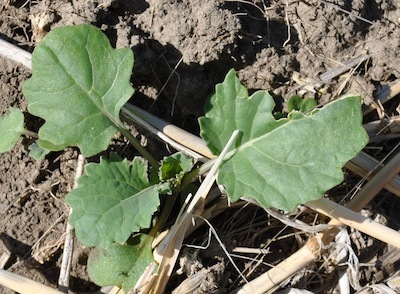 Growers hoping to seed their final canola acres this week or next week may want to consider the following tips to deal with a shortened growing season.